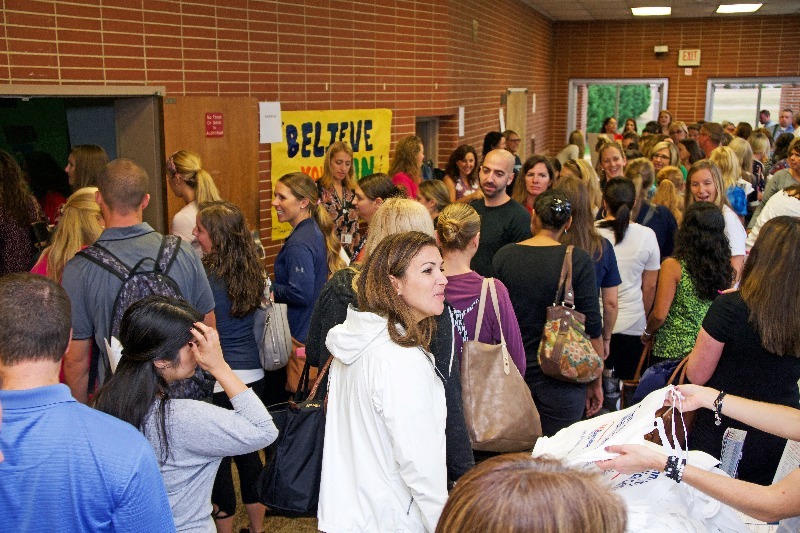 The crowd of teachers, staff, and administrators files into Intermediate East prior to the start of the district's professional development day Oct. 9. The theme of the PD day was social emotional learning. 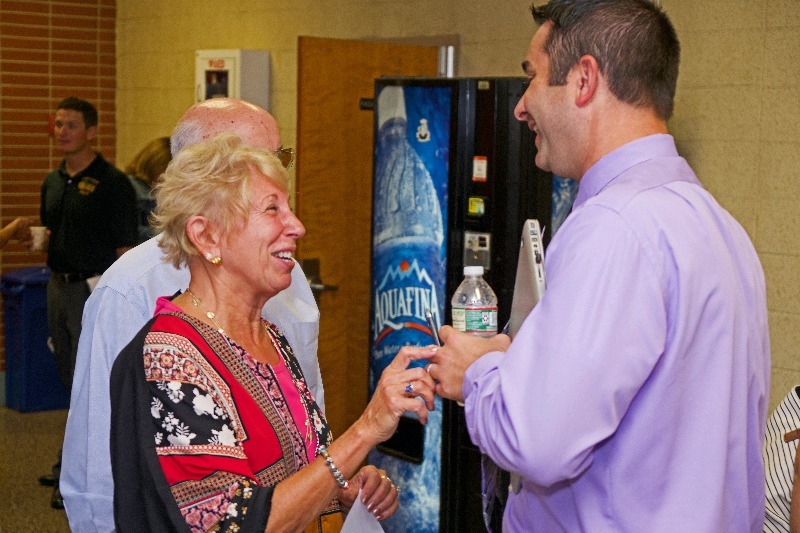 Toms River Regional Schools dedicated a professional development day to social emotional learning with a variety of workshops. 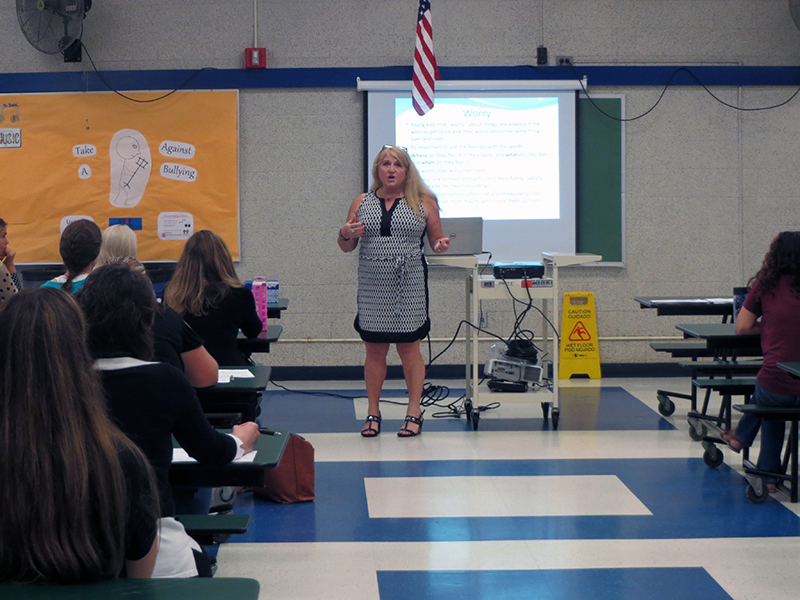 In one lively session, Julie Thompson shared with teachers how they can shift the focus on themselves to live a healthier and more active lifestyle. She shared different techniques to help focus, release pent up energy, and use physical movement as a vehicle for learning. 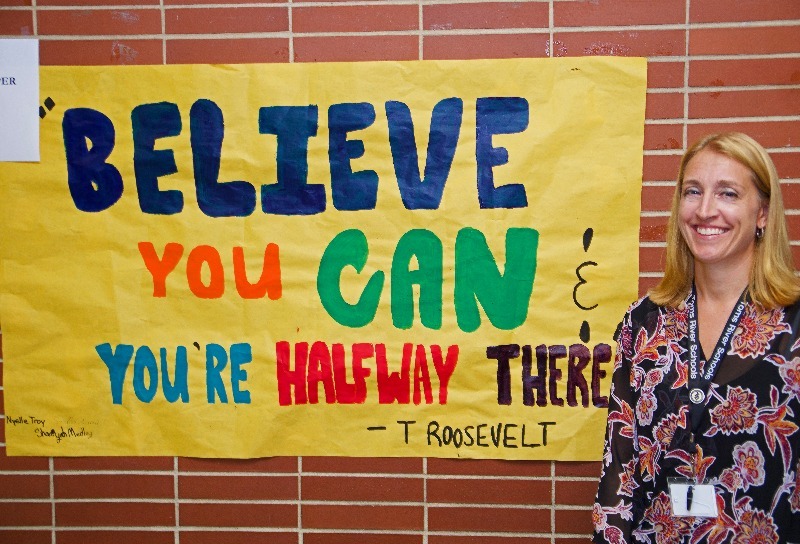 AES/HR Generalist Tracie Doss stands next to an inspiring quote hung in the hallways at Intermediate East. The impact of social and emotional well-being on overall health is undeniable, even as associated strategies continue to evolve and be explored. A more holistic, inclusive, and relationships-based approach to mental and emotional health is still in its infancy within society at large, and even more so within the classroom, where traditional mindsets and disciplinary tendencies often die hard. Count, however, Toms River Regional Schools among districts with a strong focus on social and emotional well-being. Seven of its 18 schools belong to the cohort of New Jersey Positive Behavior and Supports in Schools (NJPBSIS), an initiative to increase the capacity of local school districts to develop programs and intervention strategies that reduce occurrences of discipline and behavior problems, and subsequently increase student achievement. The district has made concrete efforts over the past several years to improve school climate and culture, and its recently-unveiled Active Learning Center offers a model environment that ties to these modern strategies. 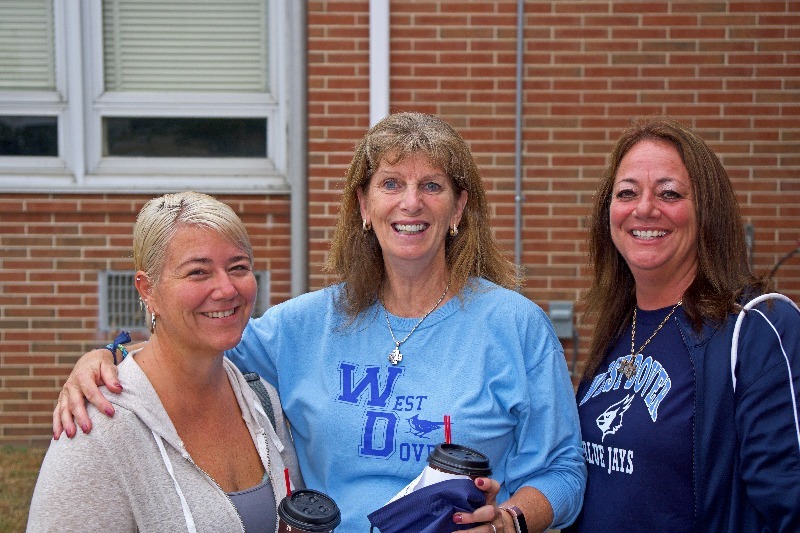 On October 9, Toms River Regional Schools offered its greatest testament yet regarding its commitment to a student-centered approach: an entire staff professional development day devoted to social and emotional learning. 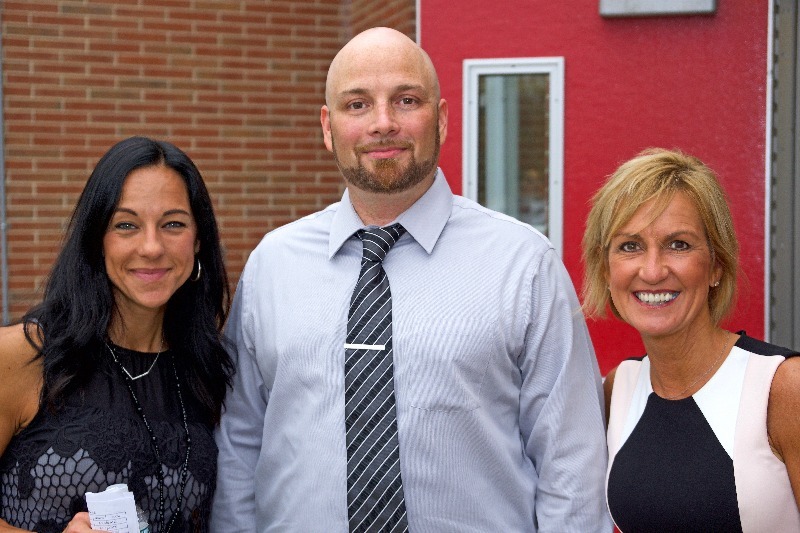 The series of workshops was designed by Assistant Superintendent K-5 Debra McKenna and Director of Curriculum K-5 Cara DiMeo, as part of the district’s Elementary Professional Development Academy. 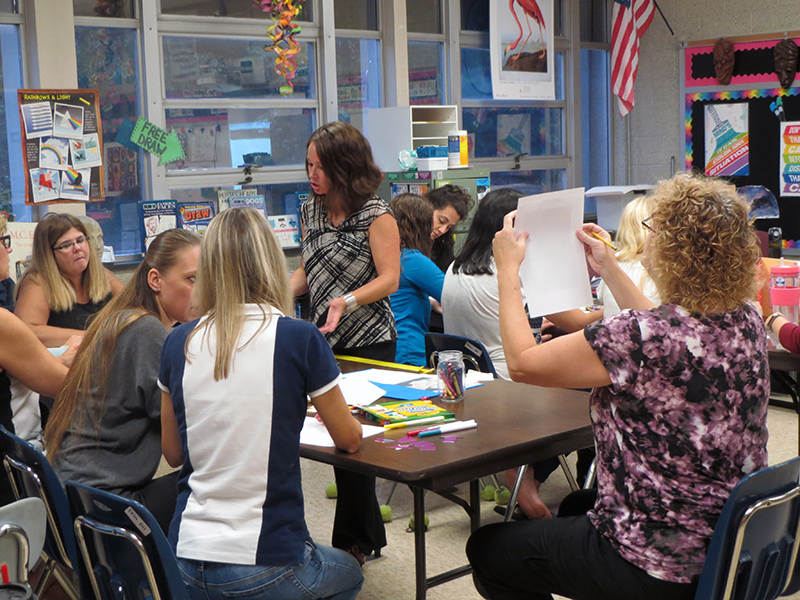 The sessions offered strategies and resources for all K-5 staff. 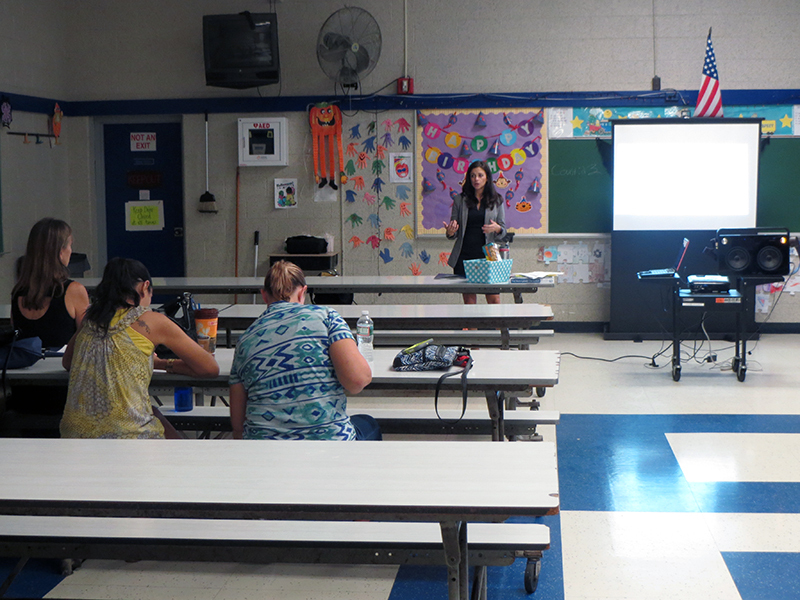 The professional development day was hosted at Intermediate East and Hooper Avenue Elementary. More than 30 workshops were spread out across three sessions, with shuttle buses providing transport between the adjacent buildings. 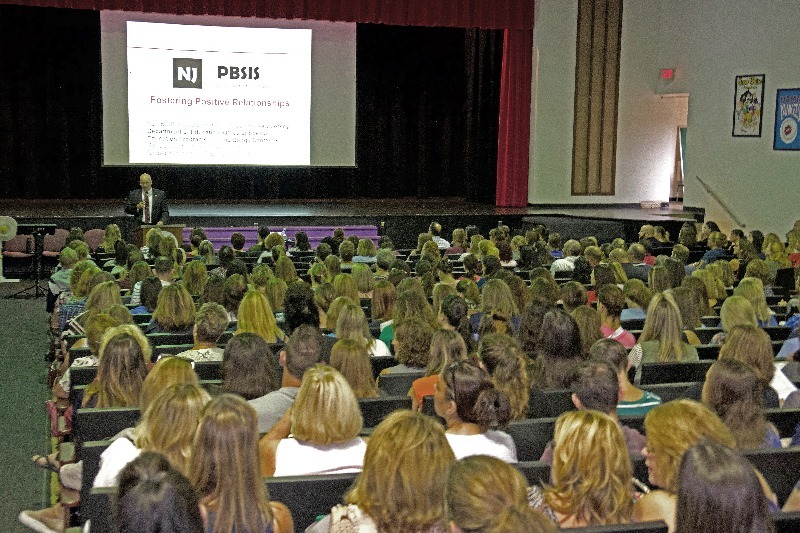 Healy’s remarks to his staff prefaced a keynote address and presentation by Scott McMahon, who helps lead the New Jersey Department of Education’s PBSIS training team. A former social worker and Abbott district educator, McMahon’s experience with troubled students has run the gamut, which helped facilitate his own conversion to social emotional learning. Tasked years ago with leading a class comprised mostly of at-risk students, McMahon recognized where he was lacking. When an otherwise disruptive and frustrating student was waiting for him in front of school early one Monday morning because his mother had been arrested days earlier, the paradigm shift for McMahon was complete. 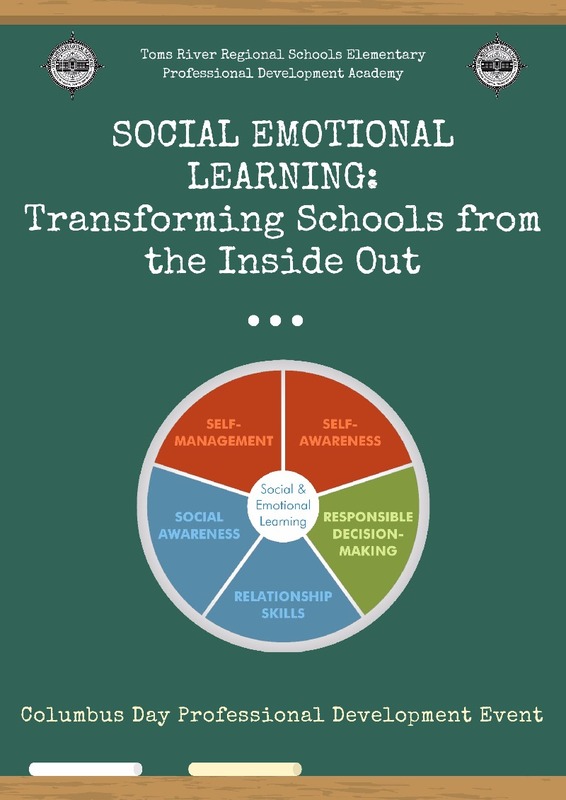 McMahon’s focal points for social emotional learning laid the groundwork for the variety of workshops to follow, and included the use of purposeful and positive language; empathy; creating problem solvers; forging the best outcomes for kids through evidence-based practices; acceptance versus tolerance; increasing the ratio of praise to correction, especially for students not accustomed to being praised; and changing momentum within the classroom. All of these topics led back to the overarching theme of social emotional learning: relationships. The tone was set for a day of learning, and teachers and staff then dispersed to take part in their pre-selected workshops, and the options from which they had to choose were plentiful, unique, and relevant. At Intermediate East, Psychologist Dr. Erin Herman conducted the class “A Teacher’s Guide to Addressing Behaviors That Stem From Classroom Anxiety,” while at Hooper Avenue, Paul Prendergrast, a 6th-degree black belt and multi-school owner, spoke about “Alternative Strategies for Developing a Positive Classroom Culture,” with the objective to empower teachers by offering methods to develop positive, mindful, and respectful students. Back in the IE auditorium, Dr. Brian Hart, chiropractor at Thompson Healthcare and Sports Medicine, hosted “Chaos to Coherence: Managing Stress in the Classroom,” aimed at improving the physical and mental health of everyone in the classroom and school. One of the most popular offerings involved lessons in improv comedy. 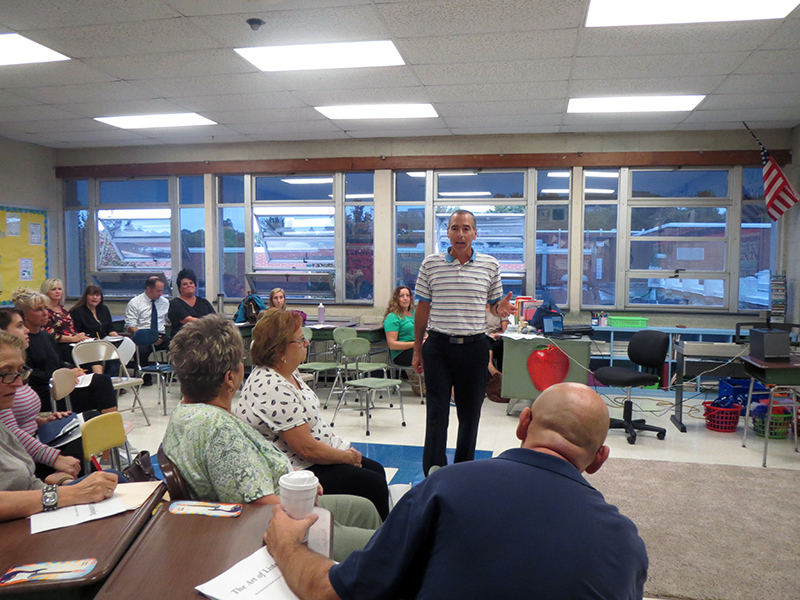 “Laughing With Me: Using Laughter in Schools to Build Strong Social Emotional Skills,” was hosted in the IE small cafeteria by Mike O’Keefe, an improv comic and teacher with 20+ years experience. With exercises that included inaccurate sign language interpretation and “yes, and …” dialogue, O’Keefe highlighted how teachers can change classroom momentum with humor. In fact, O’Keefe argued, because teachers are confronted with the unexpected each and every day, they can easily draw from the lessons of improv comedy to maintain a positive classroom environment. “By responding ‘yes, and …’ and not turning it into a negative or a ‘no’ in disguise, we can get the ball rolling, keeping things positive while moving forward,” O’Keefe said. 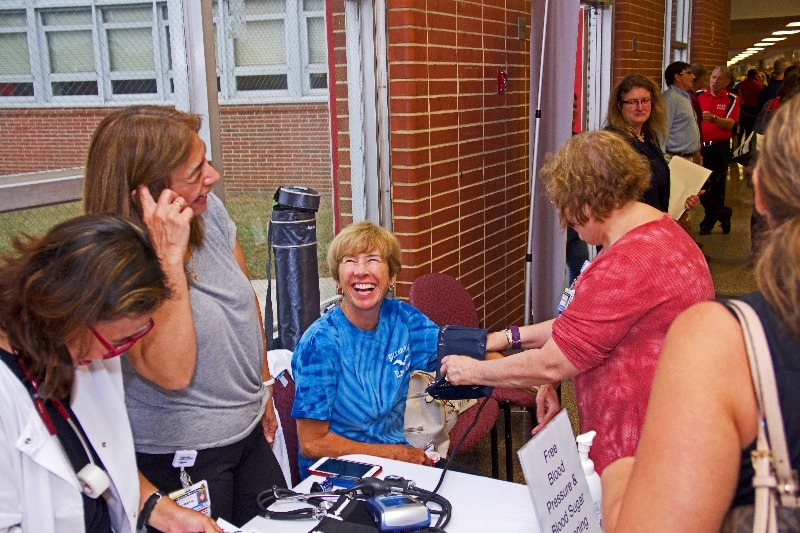 The connection between physical and emotional health was a strong current running through the day’s available programming. At Hooper, Dawn Keen from the Center for Health & Wellness led teachers through a guided meditation that focused on the relaxation of the whole mind and body. 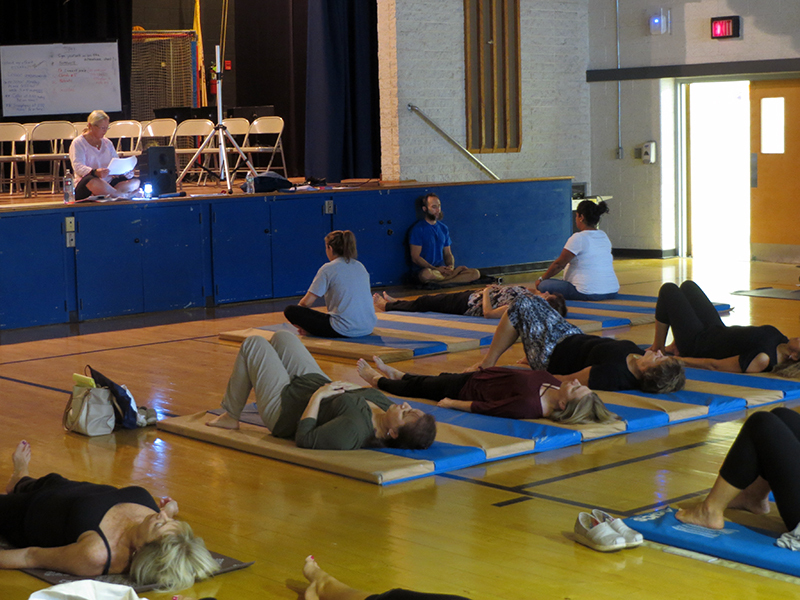 At IE, Erin Peluso of Lotus Lounge Yoga Studio hosted the “Classroom Calm Program,” arming teachers with techniques in yoga, meditation, and mindfulness to practice themselves and to introduce to students. Julie Thompson led a lively session at Hooper’s Inspire Lab during which she shared with teachers how they can shift the focus on themselves to live a healthier and more active lifestyle. She shared techniques to help develop stronger focus, release pent-up energy, and use physical movement as a vehicle for learning. “Today was a huge day for this district, our teachers, and our collective mindset moving forward,” said DiMeo at the event’s conclusion. “The entire structure of this PD event was based on what our teachers are experiencing in the classroom, and the supports we can provide them to respond appropriately. What’s so extraordinary-- what I’ve been hearing all day-- is how the techniques being shared will not only benefit instruction and outcomes, but the teachers themselves, in every aspect of their daily lives. Superintendent David Healy addresses the crowd of teachers and district staff during the October 9 professional development day. 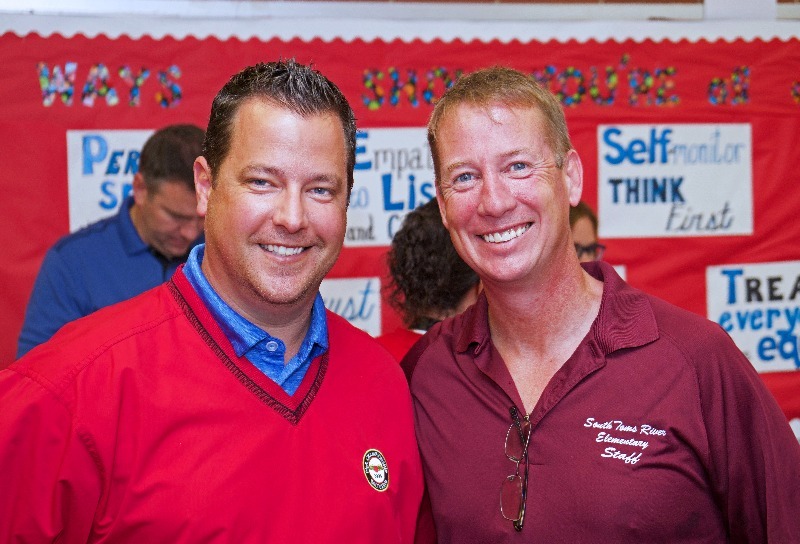 Paul Prendergast, owner of a martial arts school, shared stories from his career that helped shaped his business foundation while providing teachers with new strategies and methods they can use to positively impact and develop respectful students. Kristen Russell presented a workshop on Applied Behavior Analysis (ABA) that provided teachers with techniques and principles to bring about meaningful and positive changes in behavior. Positive reinforcement with a reward for good behavior is one such technique that was discussed. Dawn Keen, from the Center for Health & Wellness, led teachers through a guided meditation that focused on the relaxation of the whole mind and body. 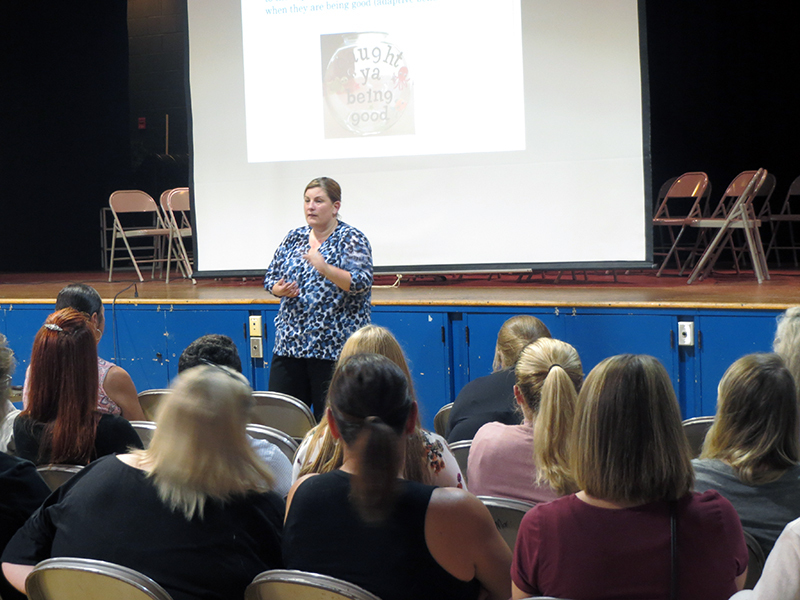 The owner of Ocean County Social Skills, Cheryl Kasper, offered her insights to teachers on the challenges of dealing with anxiety in school-aged children. She gave teachers a “toolbox” of coping skills that are effective in classroom use. Jaime Jovanis helped guide teachers through creating different art-based projects that can be used to help relieve stress in the classroom and in their daily lives. Teachers in this workshop listened to a wide range of music and explored the emotional responses that music creates. 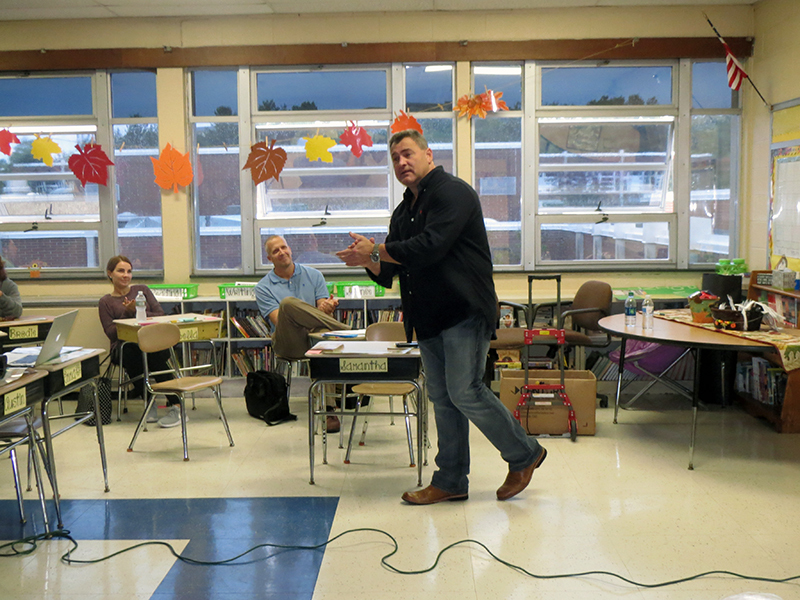 Mike Aiello, life skills teacher, also offered suggestions of activities to incorporate music into classroom learning. 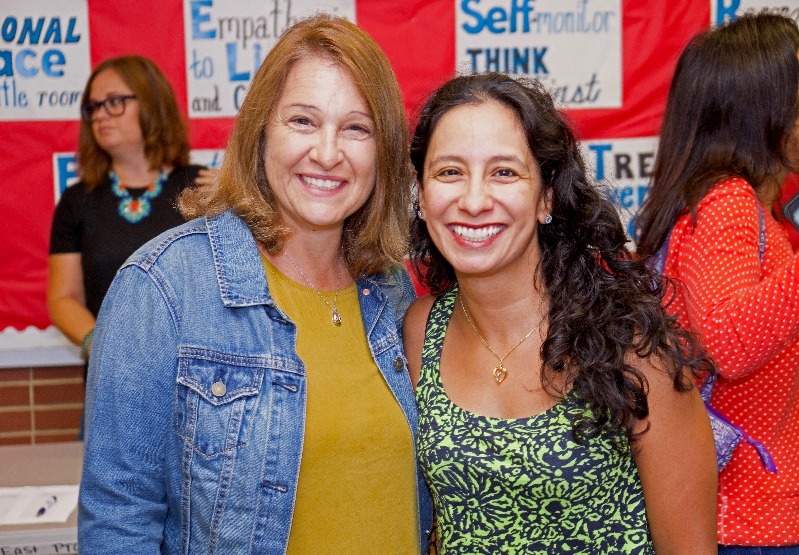 Participants in Jamie Cegerenko’s workshop learned helpful techniques to support students’ social and emotional learning by incorporating social skills and mindfulness into their classrooms. 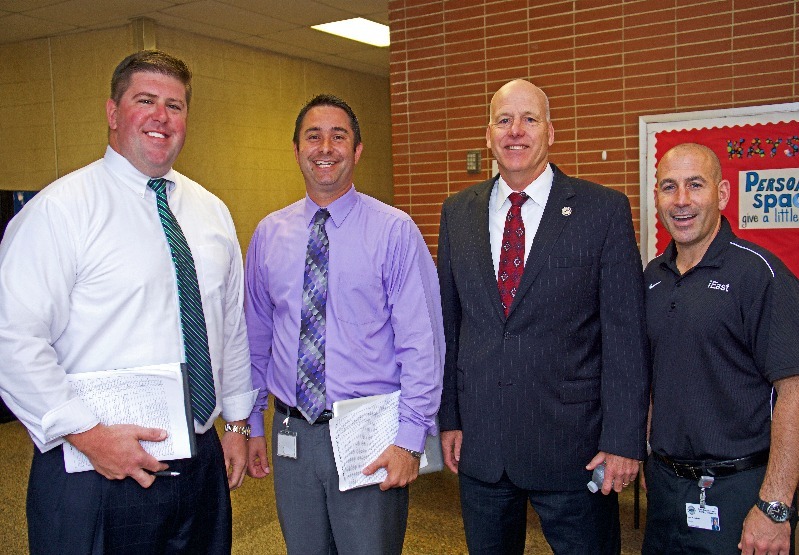 West Dover Principal Mike Pallen (left) and South Toms River Principal Dennis Holzapfel were on hand to greet teachers and take an active role in the day of training.